Pull-Out Shelf with Writing Surface of 44"
The Harloff Standard Line Dual Column 600 Punch Card Medication Cart is an easy-to-use storage device that can hold up to 600 punch cards. 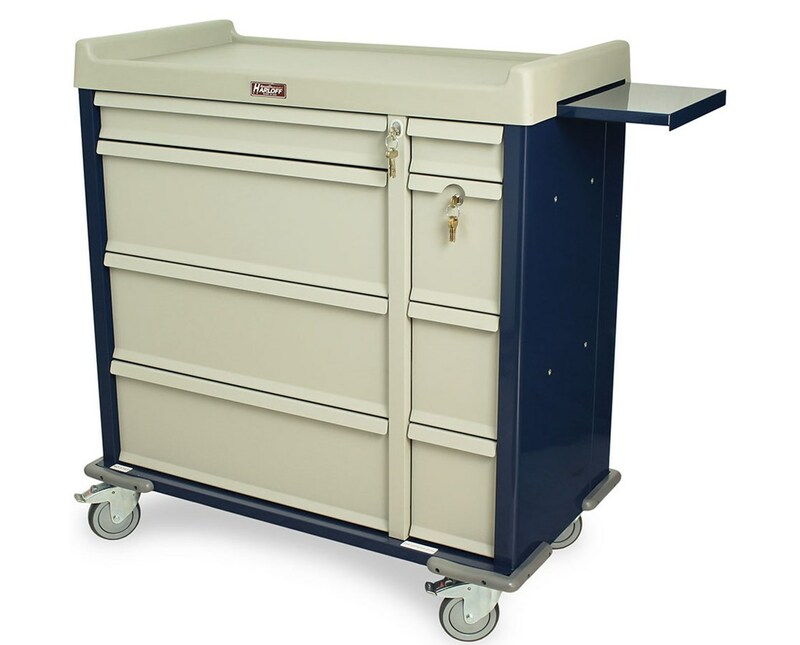 Because of how secure it is and how supplies are easily accessible, the cart is a great choice for any hospital, examination room or medical facility. Awesome Design. With a steel cabinet, the Standard Line Dual Column is well-built and has a durable, hard-baked powder coated finish with various colors to choose from. It features 8 aluminum drawers that are powered by ball-bearing, full extension slides. Drawers are configured with one 4" multipurpose drawer and three 9.75" punch card drawers with 600 punch card capacity on the left and one 4" multipurpose drawer, one 9.75" locking narcotics and two 9.75" multipurpose drawers on the right. The cart also includes a painted steel pull-out shelf with a writing surface of 44-inches and a plastic replaceable top. Hassle-free Movement. 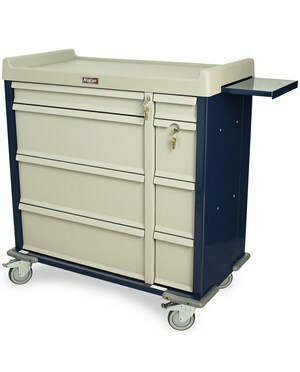 Mounted on 5" Premium Ball-Bearing Rubber Casters with one directional and two toe-locking brakes, the Standard Line Dual Column 600 Punch Card Medication Cart, with the help of integrated push handles, can be transported around the facility easily. A full wrap-around vinyl bumper is installed for added protection against collisions especially during movement.